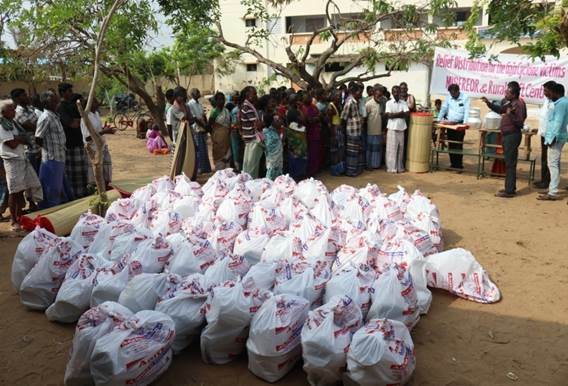 Gaja Cyclone Victims in Nagapattinam District of Tamil Nadu. The cyclone formed in the North Indian Ocean named Ockhi cyclone and crossed Kanyakumari through the Arabian Sea, the South and West boarders of Kanyakumari with 100 km/ph to 150 km/ph wind speed on November 29th night to till 30th noon in 2017 and caused severe damage to life and livelihood means of the People. 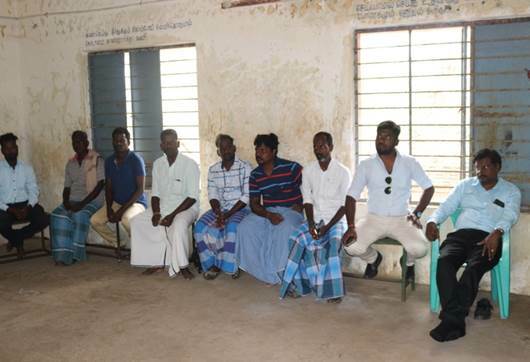 Rapid assessment of damages & immediate needs : RUC along with Inter Agency Group, Tamil Nadu conducted rapid assessment of damage caused by Ockhi Cyclone in Kanyakumari District along with the IAG member and NGOs of Kanyakumari District. Relief intervention by RUC for the Victims of Ockhi Cyclone. Beneficiary selection process: The victims representatives from the severely damaged villages met at RUC and drafted the criteria for selection of beneficiaries. A door to door survey by using a questionnaire was carried out jointly by RUC and the representatives of the victims families and consolidated the findings. The survey details were discussed jointly by RUC and the victims representatives and selected 463 victim/farmers for providing horticulture seedlings, manure 107 tribal families for providing household utensils. Also selected 43 victims, whose houses were damaged for providing roofing materials. 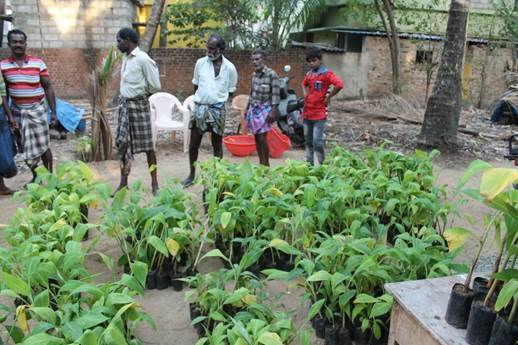 For victim farmers : Coconut – 9 nos or Banana seedlings-50 , Mango -2, Sapota -1, Goyya-2, Pomograne-2, Graviola -2, Pepper -10, Groundnut cake- 20 kg and Neem cake -21 kg. For houses damaged beneficiaries: G.I. Sheets 8 feet x 3 feet – 8 pieces each and household utensils. Household utensils Kit: Pressure cooker-1, Cooking dawa with covers-3 sets, Aluminum bucket-1, steels spoons-4, steel plates-4 and steel cups-4 and mosquito nets-2 each. Arul Devadhas, Rector, St. Antony’s Church, Vettuvenni. 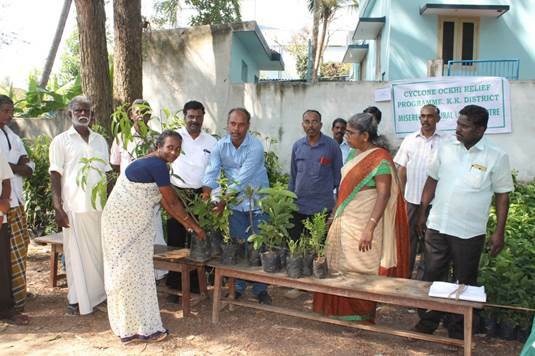 Thirumurugan, Agriculture officer (Ockhi relief). Gaja Cyclone: Heavy winds of about 140-160 kmph speed were experienced on 16th of November 2018. The highest wind speed were recorded in Adhirampattinam at 162 kmph and secondly Muthupet recorded 160 kmph. Regions of Karaikal and Nagapattinam also experienced 100 kmph winds. The affected districts are Nagapattinam, Thanjavur, Thiruvarur, Pudukottai, Karaikal, Trichy and Ramanathapuram. 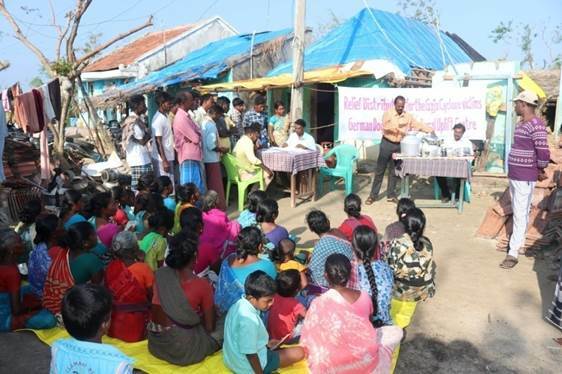 Early warning: Early warning message broadcasted on Gaja Cyclone was disseminated to the coastal communities through NGOs, who are the members of NGO network Social Action Movement and Inter Agency Group(IAG is a Network of Humanitarian agencies/ Affiliated to Sphere India) members of Nagapattinam, Thanjavur, Thiruvarur, Pudukottai, Karaikal, Cuddalore and Ramanathapuram Districts. Rapid assessment of damages & immediate needs : RUC along with Inter Agency Group, Tamil Nadu conducted rapid assessment of damage caused by Gaja Cyclone was carried out by RUC along with Inter Agency Group, Tamil Nadu in Nagapattinam, Thanjavur, Thiruvarur, Pudukottai, Karaikal, Cuddalore, Trichy and Ramanathapuram. The report was circulated to various stakeholders for their response. Consultation meeting for selection of relief materials & most affected beneficiaries held at Vedaraniyam. RUC along with the victims representatives decided to provide household utensils such as cooking pots with top covers two sets each, four steel plates, four steel cups, one water carrier-Aluminum pot, one sempu, two steel spoons one sari, one lungi, one bed sheet and two mats each to 950 most affected dalit families, those who had lost their houses. The materials were procured and distributed to 956 families from 11th to 17th of December 2018. Individual applications were received along with the photo of the damaged house and copy of the identity card for selection of the victim families. Individual acknowledgments are received along with the signature of witness/ Community leader to ensure accountability and to avoid duplication of service. RUC provided the translated copy of the relief norms of Ministry of Home Affairs to the victims to avail the relief measures from Government of Tamil Nadu. 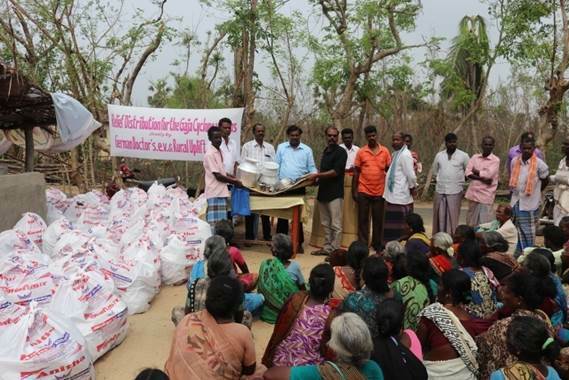 The beneficiaries and their representatives involvement was ensured in the selection of beneficiaries, selection of relief material, and purchase of relief material. 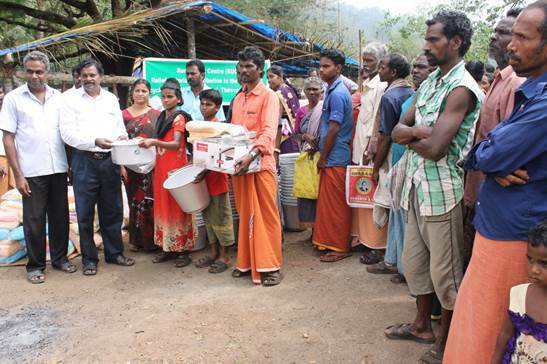 Beneficiaries have taken the ownership of the relief operations. The leaders and the beneficiaries made all the logistic arrangements during the unloading of the relief materials, storage of relief materials, custody of relief materials till the time of delivery, grievance redressal, arranging the distribution events along with the local officials and in distributing the relief materials.